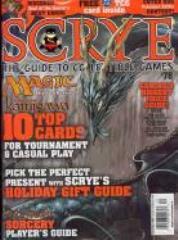 #78 "Holiday Gift Guide, Mage Knight Sorcery Player's Guide"
Learn all that there is to know about Champions of Kamigawa set for Magic! And get the scoop on what those cards will be worth with our exclusive Early Trading Guide! Also, don't miss our Holiday Gift Guide, which gives you the lowdown on all the best choices for your gamer friends - or for your non- gamer family and friends who you want to introduce to your hobby! We'll also have strategy for the new Yu-Gi-Oh! set, Soul of the Duelist, Yu Yu Hakusho's new set, Betrayal, Mage Knight: Sorcery, and much more!